In this powerful book that combines the best aspects of memoir and political history, the son of Attorney General Robert Kennedy and nephew of JFK takes us on an intimate journey through his life, including watershed moments in the history of our nation. Stories of his grandparents Joseph and Rose set the stage for their nine remarkable children, among them three U.S. senators—Teddy, Bobby, and Jack—one of whom went on to become attorney general, and the other, the president of the United States. We meet Allen Dulles and J. Edgar Hoover, two men whose agencies posed the principal threats to American democracy and values. Their power struggles with the Kennedys underpinned all the defining conflicts of the era. We live through the Cuban Missile Crisis, when insubordinate spies and belligerent generals in the Pentagon and Moscow brought the world to the cliff edge of nuclear war. At Hickory Hill in Virginia, where RFK Jr. grew up, we encounter the celebrities who gathered at the second most famous address in Washington, members of what would later become known as America’s Camelot. Through his father’s role as attorney general we get an insider’s look as growing tensions over civil rights led to pitched battles in the streets and 16,000 federal troops were called in to enforce desegregation at Ole Miss. We see growing pressure to fight wars in Southeast Asia to stop communism. We relive the assassination of JFK, RFK’s run for the presidency that was cut short by his own death, and the aftermath of those murders on the Kennedy family. 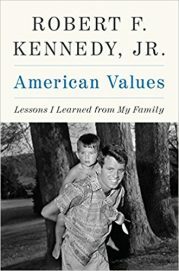 These pages come vividly to life with intimate stories of RFK Jr.’s own experiences, not just with historical events and the movers who shaped them but also with his mother and father, with his own struggles with addiction, and with the ways he eventually made peace with both his Kennedy legacy and his own demons. The result is a lyrically written book that is remarkably stirring and relevant, providing insight, hope, and steady wisdom for Americans as they wrestle, as never before, with questions about America’s role in history and the world and what it means to be American.